Its aged look suggests it was fashioned centuries ago. And although it has been created for today's themed party-goer, this mask is made in the real tradition of the Carnevale - and, with unmatched Venetian skill. Make this genuine Venetian Macrame mask your party entrance statement. 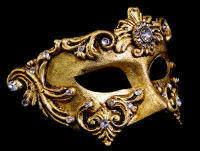 Designed to team with your costume and party theme, the mask has been painted by hand in a rich antique gold. 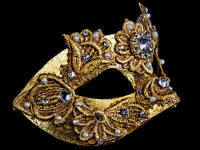 Intricate brocade in a matching gold thread sets a frame around the mask to compliment the face. Its antique look comes from the subtle crackle glaze - or 'craquelure' - painted in dense, fine lines across the surface. Of superior quality this genuine Venetian masquerade mask is delicately crafted entirely by hand on a base of papier mache. It feels comfortable against the skin and is super lightweight to wear - the mask ties securely around your head to keep it in place while you party.Take on a new identity as you slip into your chosen mask, emulating the bygone glamour and intrigue of medieval Venice and its famous Carnevale. In the 16th century, Carnevale season took hold and Venetian society celebrated every year at what used to be Europe's biggest party. 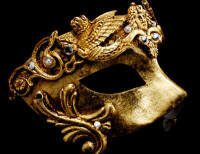 It's now an annual festival in Venice, famous the world over for its extravagant masks. Wear one of our genuine Venetian masquerade masks at your party and play your part in creating the Carnevale atmosphere that will theme your event.More than a costume accessory, it will be something you'll want to keep and display as a souvenir long after your masked ball is over. Every mask is carefully dispatched and delivered free to your door within the UK. Order yours today.